Prof. Krasnova’s research on social media (SM) platforms‘ effects on humans regarding their behavior, their needs for privacy, and, especially, their emotional effects on the psychological balance of users have been influential in both the scientific world and in society itself. Such research and opinion are quite popular at the moment. Due to the changed awareness and perception of social media comapnies, such as facebook, Google or twitter, this blogpost shall underline why, how and where SM has changed societies worldwide. First things first: In order to perceive social media companies not just as tech-based start-ups, but as structures embedded in a specific socio-cultural environment, I want to highlight the ideologies and ethical norms, that shaped the construction of such technologies. It is no wonder, that major players of the „internet-economy“ are based in California, USA, as the basis of this quick overview, i.e. Rieder: „Institutionalizing without Institutions? Web 2.0 and the Conundrum of Democracy“ (2012), states. California, and even more the region of San Francisco, have been a unique combination of high-class university research, access to funding and a very distinct culture. This culture has either been unique regarding a strong business orientation: a mindset of risk-taking and failure-acceptance, and on the other side ideological diversity: the Hippie movement with its believe in freedom, openness (of access to technologies and education), independece, anti-authoritarian beliefs paired with an „American Libertarianism„, that focused on self-reliance, grass-root-level-empowerment and fuels the idea of a laissez-faire market-economy built on the American Dream. Important to note: These findings can generally be applied to all companies in the Silicon Valley. What makes these influences so important fro the analysis of SM is that they are the companies, where these are most important and visible, if we are looking at technologies built to make people spend time, share their activities and toughts, and give them their liberties to do what they want to do. Social media is a kind of technology that is shaping and shaped by humans, unlike „hard-tech“ like microprocessor manufacturers, venture capital firms or biotechnology start-ups. Social media is creating a rich space to use the technological abilities of communication to be and stay connected ubiquitously. In order to understand the following arguments and the implicated understanding, which technologies can be called social media, I want to give some examples. Social media is more than just facebook, twitter and maybe Google Plus. It is way more. It may be helpful to understand what SM actually means: „internet-based applications that build on the ideological and technological foundations of Web 2.0, and that allow the creation and exchange of user generated content“ Kaplan and Haenlein (2010). Modern day examples range from classic said networks to collaboration (ResearchGate), content creation and sharing (YouTube, Soundcloud), business (Linkedin, Xing), blogging (tumblr, Medium, Steemit), communication (WhatsApp, Telegram, Threema, Signal) and to education and Citizen Science (MOOCs, BOINC, FaH, Seti). Summarizing all of these aspects regarding „openness“, while taking a global, not-only-western, view, one may conclude that SM democratizes information access by developing and simplifying internet and underlying technologies while investing in local markets. Especially, developing countries can profit from such investments (e.g. Internet.org) and their population has (unlimited) access to information and global knowledge unlike any time before. As a study highlights: Many people worldwide do not see a difference between the internet they use and social media, because most of their activities, their digital life, happens within SM platforms. Even if this unaware distinction between the technologie building „the internet“ and closed SM gardens may (and should) be a reason for concern, this cries for a more grounded analysis of what we are talking about when we regard to SM. 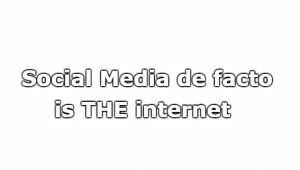 SM de facto is the internet. Without SM, the internet would still be some niche-product for weirdes and nerds, unable to give humans opportunities they would not want to lose today. As a consequence, one could even state provocatively: Basically all advantages and improvements seen through common internet access have to be credited to SM. The Arab Spring has been the most famous SM-credited uprisings in the early 2010s. It gained momentum from a small act of protest in a small Tunesian city, but thanks to the well-connected population, it rose to first a city-wide, then nation-wide and lastly to an international uprising. This revolution may not be seen as success in the western world, but most countries in the region affected most intense have reformed their autocratic/oligarchic political systems to moderate kingdoms/aristocracies or even democracies. #KONY: Started by a video documentary, this movement resulted in global awareness of active terror groups in central Africa and resulted in international help of affected countries. #BlackLivesMatter: Even if this movement is still very US-focused it raised questions of (systemic) racism against POC, women and other minorities in Germany, too. The importance is this movement’s affection to SM. #Occupy: In the aftermath of the financial crisis ten years ago, the movement called „Occupy Wall Street“ started to gain momentum by consolidating multiple international groups all over the world by calling out for strong investsigations, regulation and agaisnt socialising losses of so-called „banksters“. Other, more European-centric movements activated by SM are visible in new parties and refreshed parliamentary systems in Spain (Podemos), Greece (Syriza) and Italy (Five Star Movement). #MeToo: The revelations of sexual abuse of women by men in power resulted in global awareness for this topic. While topics like this are not common in public discourses, MeToo revealed the urgent need to talk about it and established new common ground of respect of women. “Mugabe Must Go„: In a system where the press is suppressed, SM is the only realiable source of information. This uprising has had terminating effectings on Robert Mugabe’s presidency. It is import to note the following: SM has been successful because it’s ideological roots, such as universal accessibility for every one no matter who, where and when you want it, has shaped and empowered local groups to interact with each other on local, national, cultural and even global levels that enable them to gain a voice, political and economic power. All of this has happened without the injection of political norms and cultures into the users‘ origins but has empowered them to establish their very own culture on a platform shaped by this very specific Californian spirit. Development of societies can be towards different directions. There is no specific notion underlying that development of societies needs to be directed towards globalized, liberal, western ideas. It enables the everyone to have a voice that can be heard no matter what opinion, background or economic power one has. This diversity of voice, that is eminent in democratized platforms such as SM, changes societies inevitably. Because SM is nothing else than a specific technology designed for humans‘ interaction with each other, it faces all the physical worlds‘ side effects of societies, too. That’s why, there is no doubt, that all the major player in the world of social media and other platform providers should prevent mobbing, stalking, discrimination and exposure of intimate information. They know and research techniques in order to prevent or control emotionally charged (political) debates, depression and manipulation through fake news. They also know, that there is way more to do and implement in order to protect users from suppressive regimes (e.g. Iran, Egypt, China) by fighting those and enabling (pseudo-)anonymized access to their platforms (e.g. VPNs, TOR). But, much has to be done better, more transparent and less monopoly-focusing. Issues regarding privacy, respect of local consumer protection laws, tax evasion and the general business model of clustering and selling access to users are still to be resolved but there is no doubt that social media does have incredibly huge positive impacts on global scale for everyone. Connecting people, thoughts, opinions and experiences can accelerate humans‘ development, enrich their minds and increase their respect for each other. All in all, social media has the power to develop societies on a global, inter-cultural, and trans-ideological scale because it is nothing else than a technology constantly shaped by humans, for humans and with humans. Social media has impacted the awareness, that we can be a global community and that access to information is our chance to thrive. What we need to decide in the future is, whether we want to use privately-owned profit-oriented companies we tend to depend on. There is hope: more and more decentralized, non-profit platforms like Mastodon, PatientsLikeMe and others rise, organizations like AlgorithmWatch and Open Data initiatives will prevent the privatization of public data ownership. Another important critique on SM is the closely held aggregated data sets, which are not open for public science or administration, in order to learn from people behavior, or improve their living conditions. Such data could be incredible useful for public debates and following political instructions. Social Media depends on humans‘ interaction in the physical world. Through its openness and possible interactions, it increases activation of people for causes that move them. Basically, all recent trends and movements on SM have been moving society towards a more progressive, respectful and tolerant togetherness. SM has the incredible power to activate people to give their opinion a platform – not just digitally, but also in the physical world because they see, they are not alone. The British Library – Myths and Realities: Social Media – new democracy or mass deception? 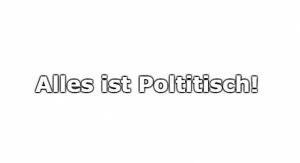 Chaosradio Folge 168: Dezentrale Soziale Netzwerke Facebook ist tot! Hoch – die – internationale – Dezentralität!